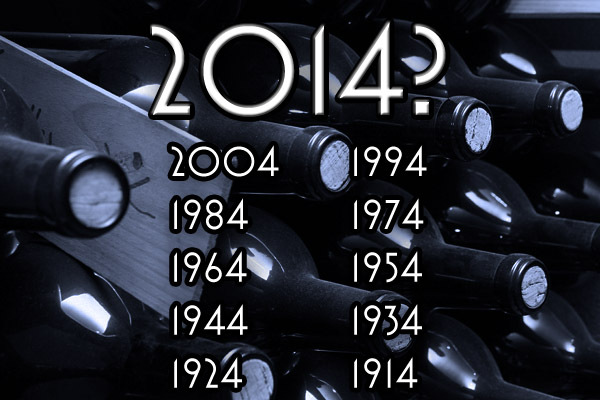 ODDS STACKED AGAINST A GREAT VINTAGE WINE YEAR IN 2014? Surprised so many of my wine friends seem to have a superstition about the odds being stacked against producing a great vintage ending in 4. Certainly for vineyards around the world the last century has not been especially kind in the decade years 2004, 1994 (good California Cabs), 1984, 1974 (again some excellent Napa Cabs), 1964 (Right Bank St. Emilion & Pomerol can be lovely), 1954, 1944, 1934 (arguably with 1937 the best of a bad spell between 1929 & 1945), 1924, 1914, and 1904. Wasn’t always the case though as pre-phylloxera Bordeaux of 1874 & 1864 I’ve read about and have been fortunate to try on a few memorable occasions produced outstanding quality in both years. I guess the recent memories of difficult conditions in 1991, 1992, 1993, 1994 followed by 2001, 2002, 2003, 2004 and now 2011, 2012, 2013 are still on everyone’s mind. Remember that in the Chinese culture 4 is considered unlucky as the word sounds like the word for death (as contrasted to the lucky 8 sounds similar to wealth and prosperity – after all the Beijing Olympics commenced on the 8th day of the 8th month of 2008). Do wine vintages run in 10 year cycles? For example, no doubt vintages ending in 9 have had a much better run than 4. Look at those delicious 2009, 1999, 1989 and those fantastic 1959, 1949, 1929, and 1899 years. Why even Jancis Robinson has chimed in with her guideline for knowing the best vintages using “divisible by 5 years tend to be a superior rule”! Yes 2000, 2005, and 2010 are excellent – as are 1945 & 1900! Maybe the Jancis rule is correct. Is there really something to all this numerology stuff? Wishing the best of luck for the 2014 harvest in all the world vineyards starting soon in the Southern Hemisphere and later this Fall in the Northern ones. I personally believe it is possible for another outstanding vintage in a year ending with a 4. Some betting people even think the odds definitely favour long streaks to be broken soon. What do you think? Which last number has been the most reliable for a vintage wine? Are you worried about a wine ending in 4?